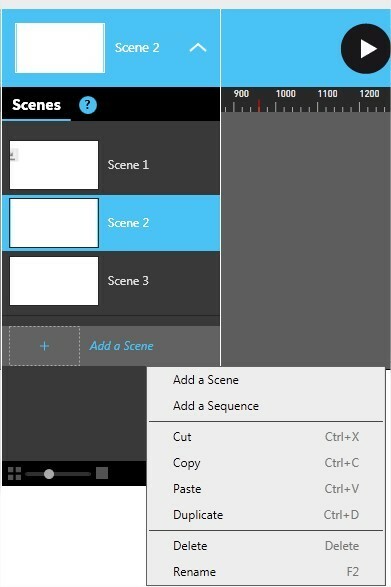 To create a sequence in the Scenes List panel right-click any existing scene or sequence in the Scenes List panel and select the option "Add a sequence". Sequences can contain scenes and other sequences. Use drag-and-drop to add a preexisting space or sequence to a target sequence. You can also use drag-and-drop to reorder items inside a sequence. 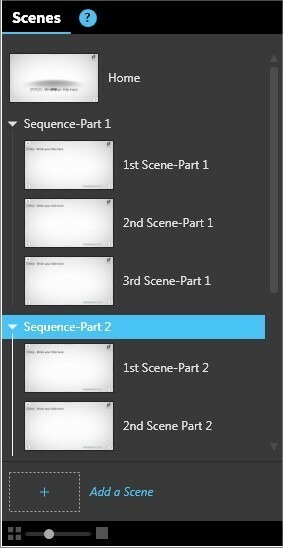 Right-click a sequence to add new scenes or nested sequences. These sequences are used in the Slideshow Presentation 2 template, available in Composer. It uses 3 sequences, each composed of 3 spaces.